epoole GREAT Helmet "rode my first 3,000 miles last year in this helmet, absolutely delivered everything I was looking for in a sleek & functional helmet. 10 out of 10 would buy again. 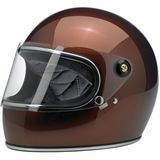 Might even buy the non-visor version for city cruising." KBH52 - Salt Springs, FL I like the look and it fits well "I guess this is old school...doesn't seem so to me...it fits well, I get good visibility and little windscreen noise. It seems well built...I don't intend to put it to the test...and it is nicely finished."